You know we just turned the corner of all of the holidays and next thing you know it'll be spring which brings spring cleaning! I know when I start my spring cleaning I am always looking for ways to change up each room to try to improve it! If you are looking to redo one of your rooms Target and GE Reveal Light Bulbs want to help you out! With the Reveal Light Bulbs you'll reduce the yellowish glow of normal bulbs and create more natural light in your room! You can check out the review that I did a few weeks ago HERE! 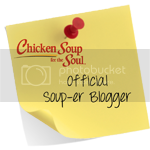 I've teamed up with a few of my blogger friends to bring you this giveaway! 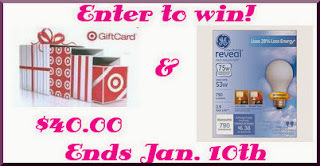 We're giving away a $40.00 Target Gift Card and a box of GE Reveal Light Bulbs to one lucky winner! 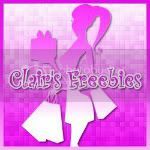 Just enter to win using the Rafflecopter below! Giveaway begins now and ends on Friday, January 10th at 11:59 pm Eastern time. Good Luck!! Jeans for my 9 year old! I would use it to get some boots! Buy my granddaughter a birthday gift! Not sure. I would first go to the clearance sales and get towels. Something to replace the Christmas decorations..to brighten up the living room. I would use it for the Just Dance 2014 for my Wii. Some hair products for me and makeup for my daughter. I would use it for some thermal underwear and makeup! It' so cold here in Connecticut! I would use it for my grandchildren. If I win, I will put the Target GC towards some new bathroom rugs and a new pair of leggings :) Thanks for the very nice giveaway! I would buy a lamp for my daughters room. Her room is just so dimly lite! I'd buy some pants for work. If I win the Target GiftCard I would buy my boyfriend a nice pair of dress pants for work! Thank you!! I'd use it for goceries. I'd use a gift card for a birthday gift for my daughter, who has a January birthday. I would use the Target gift card on groceries. Thanks for the chance! Would by a rolling bookbag for college because college textbooks are heavy!! I would probably buy some movies for my son. 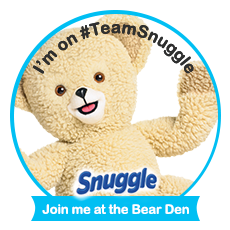 I owuld buy my newest granddaughter some heavy pajamas..she doesn;t have much and it is so cold ! a new shower head and shower curtain! to get my daughter some boots. I'd use it towards an ottoman that I've been wanting and saving for! I would buy organizational supplies! I need a couple more three drawer organizers and new yoga pants, so I think I would start there. I would get some work out clothes. I would buy my grandson a gift for his 1st b-day! There is so much I want from there I don't know! We could use a new shower curtain and towels...this would be great for that! i would use it towards a new rug. thank you! both of my sons have birthdays coming up so I would use it to buy them some presents. Oddly enough, we are completely out of lightbulbs so I would use it for that. When we buy them, we stock up for the year so we're not always needing to run out for "a" lightbulb. diapers! We have two in diapers still! I would buy something for my little one due next month! i am in desperate need of a carpet cleaner and would love to use this target card on one! I would buy a new set of queen-sized sheets. I would buy something for my son's birthday. I would use it for underwear, lol! !